Directions: Add a few spoonfuls of cane sugar, coarse sugar, and cinnamon to a plate. Run an orange segment around the edge of the glass, then press the glass into the cinnamon sugar mixture to coat the rim. Add a few orange slices in the bottom of the glass, fill with ice, then add the Grand Marnier, tequila, and apple cider and stir to mix. 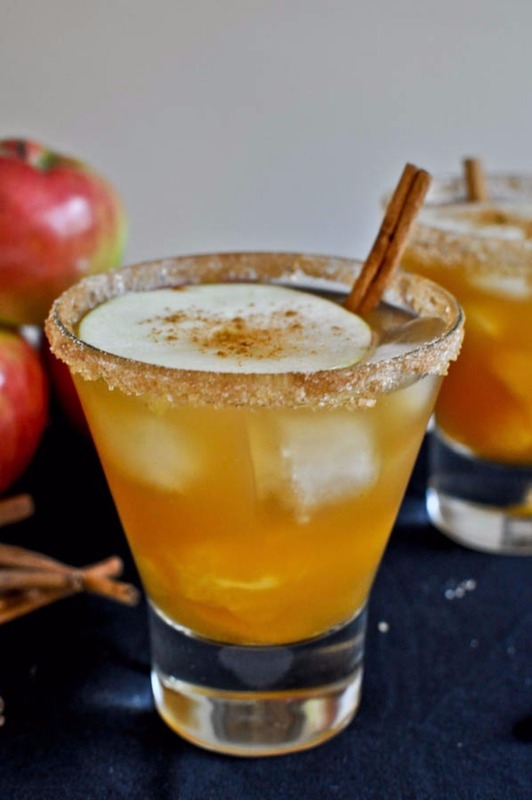 Garnish with apple slices and cinnamon sticks. Enjoy! Recipe serves 1 and is easily multiplied. 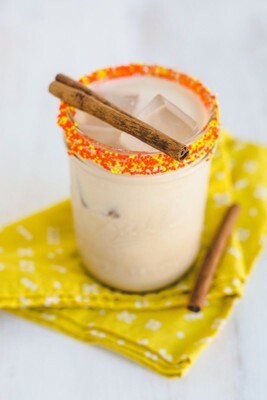 Note: Even if you prefer silver tequila regularly, gold tequila for this recipe really gives a warmth that matches the cider and cinnamon perfectly. Directions: Mix pear juice and vodka in a pitcher or shaker. Split open the vanilla bean, and scrape the seeds into the juice and vodka. Add 1 cup ice, then give it a good shake. Pour into cocktail glasses over more ice and serve with sugared rim. Recipe serves 4. Directions: Brew two teaspoons of tea (or two tea bags) in 6-8 ounces of water for four minutes and flash-chill. Combine 3 oz of brewed tea with 1 oz Captain Morgan Original Spiced Rum. Sweeten with agave or sweetener of choice. Muddle in fresh strawberries, blueberries, and raspberries. Serve over ice in a rocks glass. 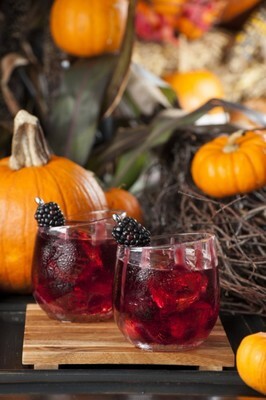 Garnish with blackberries. Optional Halloween garnish: Purée raspberries to "bleed" down the side of glass. Recipe serves 1. Directions: Combine all ingredients together and stir, stir, stir. Refrigerate for an hour or so (or longer!) before serving. Recipe serves 4 to 6. Directions: Crush the large sprig of rosemary in your hand and add to the shaker. Add the bourbon, lemon juice, maple syrup, and ample ice. Shake vigorously for 15 seconds. Strain mixture into rocks glasses with ice and garnish with remaining rosemary sprig. Recipe serves 2. Directions: Cream together butter, sugar, cinnamon, nutmeg, cloves, salt, and vanilla. Roll out into a cylinder, wrap in parchment paper, and freeze until firm. You can give the wrapped mixture as a gift, or pull out whenever you want a cup. When ready, slice off about 2 tablespoons of the butter mixture into a small mug. 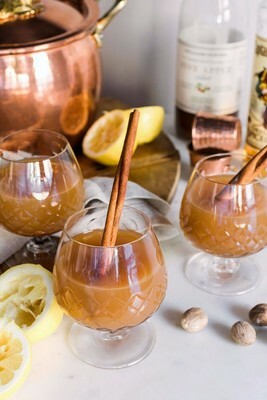 Pour 2-3 ounces of rum into each mug and top with boiling water or apple cider. Serve immediately. 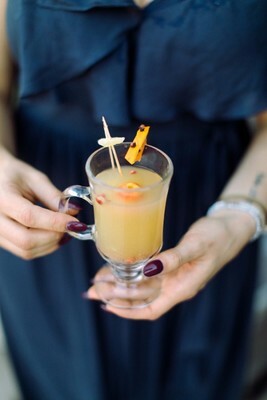 Mulled cider cocktails are having a big moment right now, so be sure to check out these tasty recipes here for more. Directions: Place two mugs in the freezer about an hour before you'd like to serve the floats. Place 2-3 scoops of vanilla ice cream in each mug. In a small pitcher or cocktail shaker, combine the apple cider, cinnamon simple syrup, apple schnapps, and bourbon. Shake to combine. 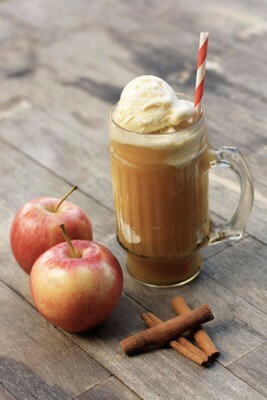 Pour the apple cider over ice cream and garnish with a cinnamon stick! Recipe serves 2 and can multiplied easily. Cinnamon Simple Syrup: Combine 1/4 cup of water, 1/4 cup granulated sugar, 1/2 tsp ground cinnamon, and one cinnamon stick in a small saucepan. Place over medium-high heat, and allow to cook until the sugar is dissolved, stirring frequently. This should take about 2-3 minutes. As soon as the sugar is dissolved, turn off the heat and allow the syrup to cool to room temperature. Once cool, strain through a fine mesh sieve into a container and store in the fridge until ready to use. Directions: Slice a fig (about 1/4 inch thick slices) and place 2-3 slices in a glass of good champagne or Prosecco. 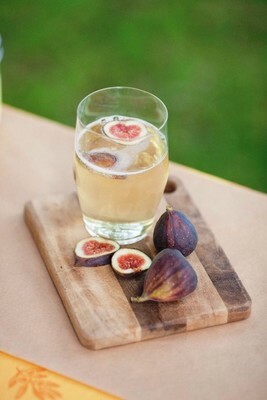 For maximum flavor let the figs soak in the bubbly for a few minutes before serving. The flavor will have a nice undertone. If you prefer to make a fig syrup you can boil about 1 oz. of water with 1 teaspoon sugar and figs, then simmer. It will make a nice syrup you can add instead of the slices. Just add to your bubbly and gently stir. Directions: Cut all your fruit in equal sized slices and drop into the bottom of a pitcher or glass jug. Add a cinnamon stick. 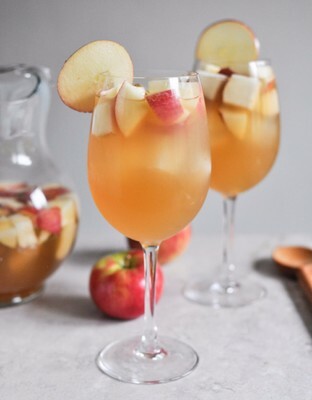 Pour the whole bottle of wine, bourbon, and apple juice over the fruit and gently stir to combine. Cover and chill in the refrigerator for a minimum of 3 hours. 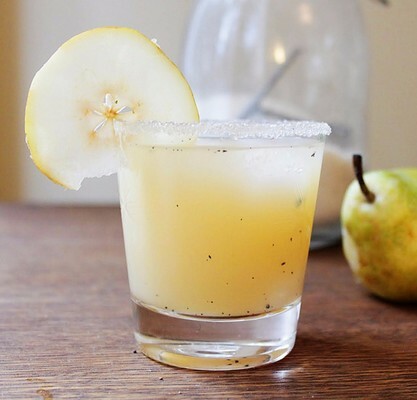 The flavor is best if it soaks overnight before drinking, but if youre tight on time you might want to add a bit more apple juice to take the edge off. Serve cold or room temperature, garnished with a few slices of the fruit and a cinnamon stick. Recipe serves 2-4. 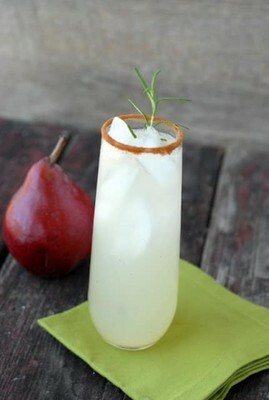 Directions: Rim collins or highball glass with gingerbread spice. 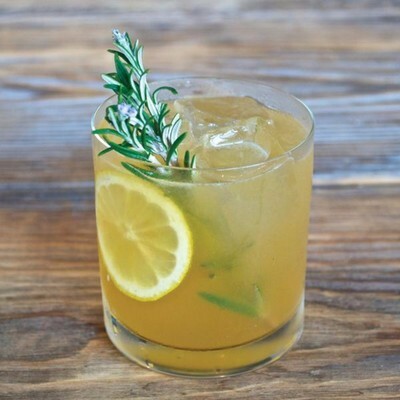 In a shaker mix vodka, ginger liqueur, lemon juice, fresh ginger, and rosemary with ice. Shake vigorously. Fill glass with ice, strain shaker into glass, top with bitters and pear soda. Garnish with dehydrated pear chip or rosemary sprig. Recipe serves 1. Directions: Dip the rim of the glass in agave and then roll in nonpareils. 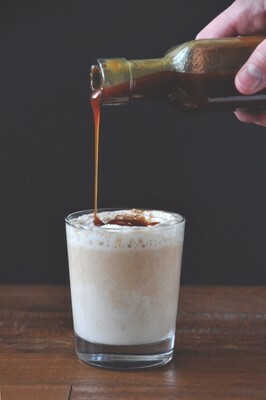 Then fill a glass with ice and combine vodka, Bailey's, half and half, and syrup. Stir and serve. To make the pumpkin spice syrup, combine 1/2 cup brown sugar, 1/2 cup water, and 1 tablespoon pumpkin pie spice in a small pan. Heat and stir until the sugar has dissolved completely. Let it cool, strain into a container, and keep it in a sealed container for up to two weeks in the fridge (use it for coffee, tea, or cocktails!). Recipe serves 1. Directions: In a shallow dish, mix together a couple of tablespoons of sugar and about 1/2 tsp cinnamon. 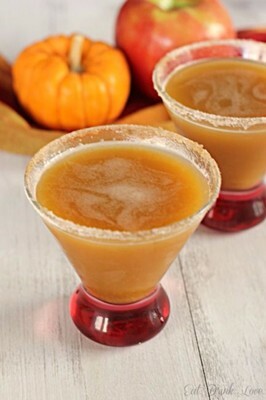 Rub some apple cider along the rim of each martini glass. Dip the rim in the cinnamon sugar mixture to coat. In a cocktail shaker, add about 3-4 ice cubes. Add in the pumpkin puree, apple cider, vodka, and ginger ale. Shake well and pour into the martini glasses and serve. Recipe servers 2. Directions: In a saucepan over low-medium heat, melt the chocolate chips and 1/2 cup of the milk, whisking often (about 3 minutes). Once melted, add the rest of the milk, the pumpkin and the pumpkin pie spice and stir vigorously to incorporate. Pour a small amount of the hot chocolate into two serving glasses, add one ounce of Kahlua OR one-half ounce of bourbon (bourbon is much stronger in taste). Top off with hot chocolate, stir and then top with whipped cream, caramel sauce and more pumpkin pie spice (optional). 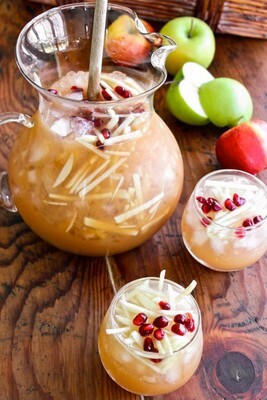 Directions: Add the apples to a large pitcher reserving about 1/2 cup for garnishing. Add the cognac, apple cider, and chilled cava. Stir. Fill the pitcher with ice. 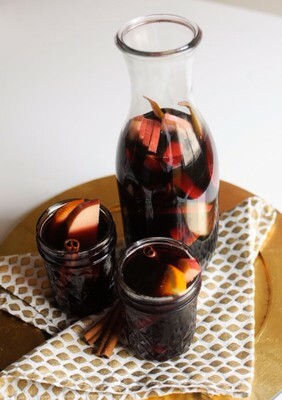 Pour the sangria into glasses filled with ice and top with sliced apple and pomegranate seeds. Recipe serves 8. Directions: To make thyme simple syrup, combine 2 cups sugar, 1 1/2 cups of water and 6 thyme sprigs in a saucepan over medium heat. Bring up to a boil and reduce to simmer, until the sugar has fully dissolved, about 5 minutes. Remove from heat and place the syrup in the fridge to cool. Place all the ingredients in a large pitcher or carafe with ice and stir. Fill your glasses with crushed ice and fill. 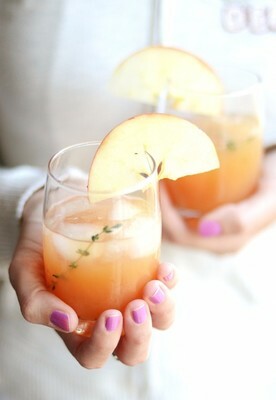 Place a sprig of thyme inside and put an apple wheel on the rim. Recipe serves 6. Directions: Combine all ingredients into a cocktail shaker filled with ice. Add the half and half last to prevent curdling. Shake and strain into your metal mug filled with ice. 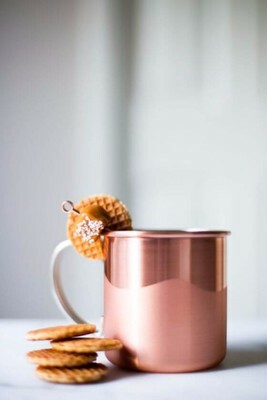 Garnish with salted caramel, a mini stroopwaffle, or both. We prefer both. Directions: Add about 1oz of water to a pot, then add in sugar and heat over medium. Stir occasionally until the mixture turns amber in color and ALMOST smells burnt. Immediately add in the rest of the water (400 ml). It will boil and sizzle violently, so remove from heat. Stir mixture until everything is dissolved then add ½ tsp Kosher salt. Stir again until salt dissolves then store in fridge to cool. 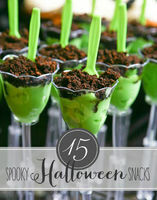 Did you love browsing 15 Fall cocktails to try and now you are ready to move on to some halloween inspired snacks? We are sure you are prepping for a spooky Halloween night and these are sure to do the trick-or-treat.